Imagine the 5th biggest city in the Americas. Now, imagine the number of things you can see in this city. This is Bogotá. For anyone coming here, you probably have heard of the usual tips and guides, like go to the Botero Museum, the Gold Museum, Plaza Bolivar, etc. We’re not saying that these places aren’t worth a visit, but we understand that sometimes you might want to go somewhere nice away from the flocks of tourists. 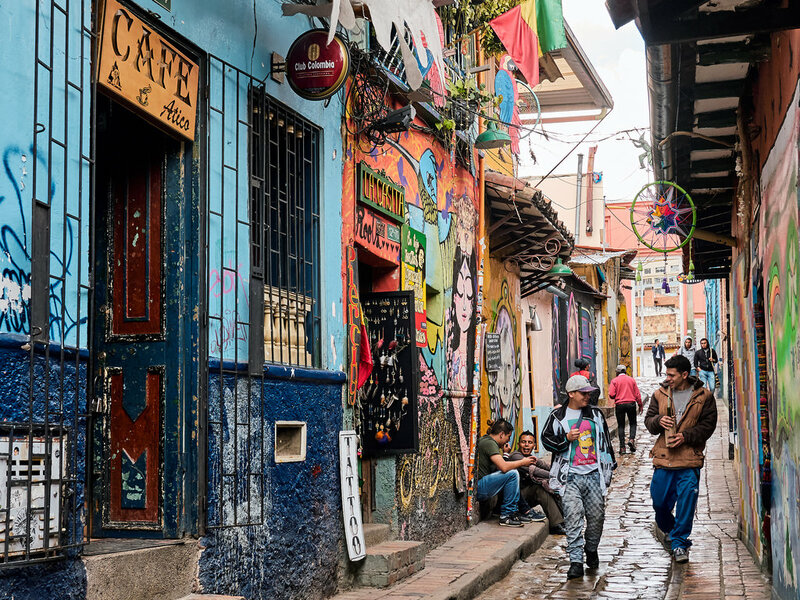 In Bogotá, there are tons of underrated places that suffer the injustice of being classified as “ok” or “not worth the trip”, but we are against injustice and therefore here are the top underrated spots in Bogota! This one is Jamie’s personal favorite and is especially recommended for the architecture lovers out there. This is a library designed by one of Colombia’s most iconic architects, Rogelio Salmona. He worked with one of the most iconic architecture legends: Le Corbusier. If you’ve been noticing the brick aesthetic around Bogotá, he was the one who influenced it all. One of Salmona’s greatest works is the Virgilio Barco library and park. Seeing a trashed filled Bogotá, he had the genius idea of collecting all the trash in the city and putting it here, creating hills and terrains of the landfill, and built the library which is already amazing by itself. One of the coolest experience he wanted to give users is the feeling of not being in a chaotic city. The trees and small hills really create a quiet little bubble for the visitors. It is perfect for a picnic, nice walks or bike rides. Maybe try reading one of the more than 92000 books available or studying/working for a while(they have free wifi inside). Location: It is located right next to Parque Simon Bolívar at Carrera 60 and Calle 63. You can get there by transmilenio by getting off at stations Salitre – El Greco or Movistar Arena. Many people hear about the botanical garden but tend to ignore it. The botanical garden of Bogotá is one of the most peaceful places to be in the city. Unlike, Simón Bolívar park, the Jardín Botánico is not always crowded. Because it is considered a museum, certain restrictions apply, such as entrance with sports equipment like balls is not permitted, making this garden a quieter and more relaxing green zone. It is home to many different species of mostly high Andean vegetation with a new ‘tropicarium’, currently under construction, which will be opening soon. It is truly a tranquil place to enjoy nice calming walks among the forest; another place to escape the noisy city. It also has a small exhibition hall that occasionally hosts different exhibitions (information about current and future exhibitions available on their website). Location: Near Parque Simon Bolívar on Calle 63 with Carrera 70. You can get there by taking transmilenio to Avenida Rojas station. Cost: 2,700 COP(approx. USD$1) for adults and 1,400 COP(approx. USD 50 cents) for children of 4-12 years. This is one of the least well-known museums in the city. Being part of a university, Corporación Universitaria Minuto de Dios, this small museum is tiny and does not require much time to explore. The 4-story building hosts many interesting temporal exhibitions, but when you visit, don’t miss the cool sculptures out front. This really isn’t the best museum in the world, but if an art enthusiast like yourself have time, you should take a short trip there. What more, the neighborhood has gone through a social transformation where many graffiti artists came in and repainted the neighborhood, so if you take some strolls around the neighborhood, you can also see some interesting murals. For any information about their current exhibitions, check here. Location: A 5-minute walk from Minuto de Dios station. Hours: Tuesday to Friday 9:00 am to 6:00 pm; Saturdays 10:00 am to 4:00 pm. There are many hiking trails in Bogota’s eastern mountains like the most famous ones: Monserrate and Quebrada La Vieja. Both of these can get very crowded; Quebrada La Vieja was closed due to the damage caused by the high number of visitors during the weekends and Monserrate gets annoyingly crowded on Sundays. Now, if you go a bit north, right by the beautiful neighborhood of Usaquén, you will find this nice through-the-jungle trail up the mountain. It can be a bit challenging if you don’t practice any sports and/or have just arrived to the 2600m above sea-level city, but the the view following a nature-filled trail is rewarding. Location: Get to the point on the map where you will see a gate. Just go through it and follow the paved street until you see a ‘acueducto’ sign with its little frog mascot. Go pass it and follow the trail up. When you get to the top, you can still go a bit higher to another viewpoint through a steeper way. Don’t forget to look behind and spot the embalse San Rafael lake! Hours: every day from 6:00 am to 12:00pm. Previous 5 Best day trips near Bogotá: go by yourself.